A step-by-step plan to help adoptive parents plan successful outings for children and their friends. Middle-grade readers will appreciate receiving one (or all) of these books for a birthday or holiday gift. Adoptive parents share how much it cost for them to adopt domestically and internationally — and how long they waited for their child — in our 2015-2016 Cost & Timing Survey. We knew it was possible for the girl we were fostering to be reunited with her birth mother. But that didn't make it hurt any less. Dana E. Johnson, M.D., Ph.D., on introducing new foods and addressing feeding challenges in a newly adopted child. When did you know adoption was in your future? AF readers reflect. There's no way around it — expanding your family is expensive. Can the federal adoption tax credit help? Sleepovers and play dates give our kids an intimate glimpse of life in a different family — and may prompt reflections and questions. 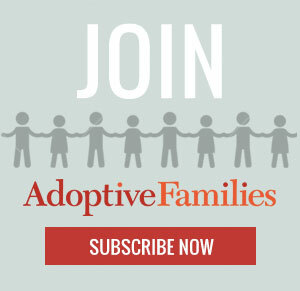 Grade-schoolers need to know how they connect with their adoptive families. I don't always know how our racial differences affect my daughter. But I know that having a role model of the same race has been a blessing for her — and for me. 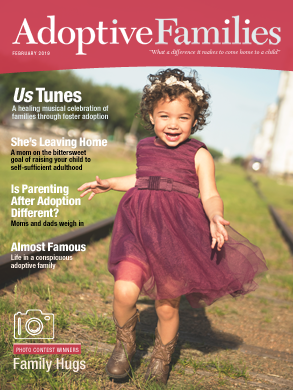 Expert tips for adoptive parents to help your child make and maintain peer relationships. A parent's role changes when a teen leaves the nest. Here's how to start relating to your child as a young adult, and reinforce your bond.